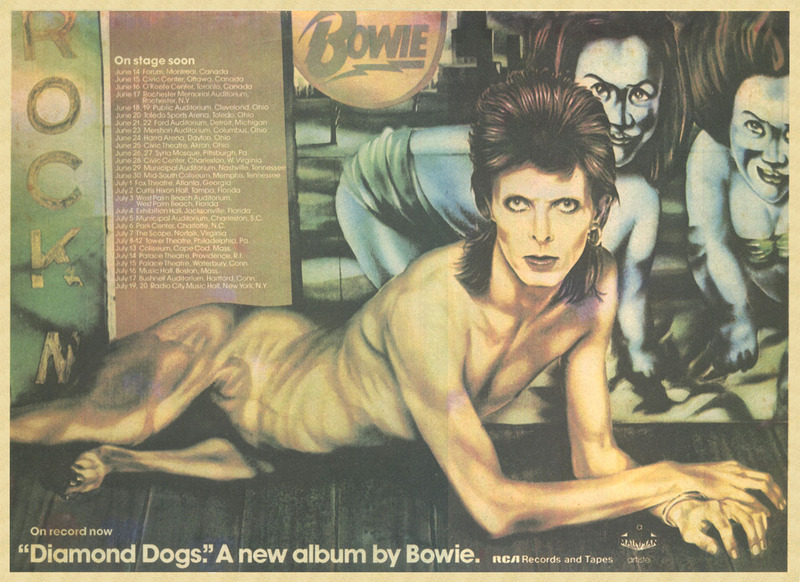 This entry was posted on Monday, September 27th, 2010 at 9:53 am and is filed under Diamond Dogs: 1974. You can follow any responses to this entry through the RSS 2.0 feed. Both comments and pings are currently closed. Excellent piece, but I must add that ‘Chant’, in its vinyl format, never actually ended in a locked groove, and so the coda on those subsequent CD reissues is authentic. damn, my memory completely wronged me. 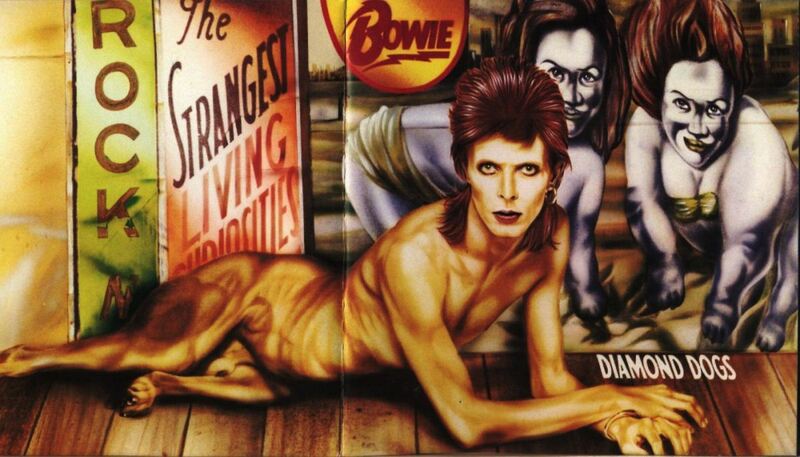 I could swear one of my friends had a Diamond Dogs w/a locked groove but perhaps it was just a skip! will correct that: thanks. Hmmm. The key is to listen to the guitar: that pattern of six eighth notes (I’m hearing it always on “1”) alternates every five beats and every six beats – so I’m inclined to go with Pegg on this one. You’re right that the percussion doesn’t follow that pattern, though. But unless I messed up, if you just count along with the guitar, and do every other bar as 5/4 and 6/4, you’ll never lose your place. and then it endlessly alternates/repeats: one way to spot the different sections is that, although the riffs may appear identical, the first section always starts on an E major, whilst the second always starts on a D.
I’ve heard from other sources about the locked groove ending too – and because I first discovered Diamond Dogs on cassette in 1990, grew to assume that I wasn’t getting the full experience of Chant. I’m kinda heartened that I’ve been getting the real deal all along! Try convincing your parents to let you go to this concert. Since my mother thought Bowie was “that Alvin Stardust man”, I probably would have managed it. Laughed out loud at the Alvin Stardust man comment! Great blog mate! I always thought that the track ended with a loop of Bowie shouting “Rock!” rather than the first syllable of “Brother”? Didn’t know about the Wedding Present cover – nice find. The site is always great reading, keep it coming. This is my favorite cover. For some reason, I’m quite enamored of this song. I guess it’s because the images I think of when putting it on are awesome and terrifying. It’s also pretty much the only way such a bizarrely unique record could have ended. Plus, it’s a great title! Musta been why I <a href="http://circlingskeleton.tumblr.com&quot; named one of my blogs after it. Nice blog, good info. though i must add that this song is the is an attempt from david bowie to musicalize the “Two Minutes of Hate” from 1984. Sorry for my bad english, it’s not my first language. Interesting. Two minutes hate translated into orgiastic dance music is pretty brilliant, as well as being a good find. Know you posted this comment a few years ago, but your English seems fine. Just dug out my USB turntable and vinyl to check, it just fades off into echo way before the runout groove. At this moment the entire group of people broke into a deep, slow, rhythmical chant of ‘B-B! ….B-B! ….B-B!’ – over and over again, very slowly, with a long pause between the first ‘B’ and the second – a heavy murmurous sound, somehow curiously savage, in the background of which one seemed to hear the stamp of naked feet and the throbbing of tomtoms. 1984 describes the party members chanting ‘buh-buh-buh’ (for Big Brother). Do you really think I’d show that picture to my parents? As a matter of fact my dad (and his girlfriend) took me to my first Bowie show, the Isolar tour. 🙂 The Diamond Dogs cover wouldn’t have put him off, far from it. Actually, my wife did get manage to convince her parents to let her go and attend her first rock concert which was Bowie’s Diamond Dogs tour. Even though she would only turn 16 shortly after the concert. Of course, she was disappointed because by Cleveland, Bowie had radically changed it to the Philly Dogs tour format. Though I was just listening to “David Live” and finding new wonders in its radical shifts in tone and form as he was hurtling towards “Young Americans.” The Latin jazz-slash-Tito Puente version of “Aladdin Sane” was an amazing balancing act, considering that Garson’s solo was fairly intact. i hear the end as an echo of the (Big?) “Brothers!” on the Stooges TV Eye. The phrases in the song group into threes, if you count the vocal interjections as downbeats. The trick is that behind it all is a kick/snare alternating backbeat, meaning that it takes two cycles through the larger period before you get an actual repeat. Sixty-six beats. Numerology ahoy. Going through some of my vinyl and digitising them (slow project), this morning I played Eno’s 1974 album ‘Taking Tiger Mountain By Stratagy’ and side 1 ends in a lock groove! I knew something I had had a lock groove but couldn’t remember so with DD out of the running it was great to find out what.